Students studying turfgrass management at Oregon State University receive a hands-on education, taking the scientific concepts learned in the classroom into the field for practical application. 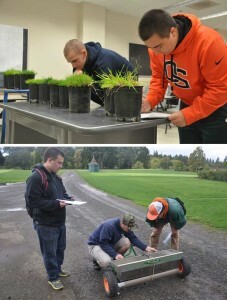 As the turfgrass specialist at Oregon State University, my primary responsibility is to teach and advise undergraduate and graduate students in the Department of Horticulture through a series of in-person and online turf management courses covering topics from home lawn maintenance to irrigation installation. I am also the advisor for the undergraduate Turf Club, a very active group that regularly meets with industry members, participates in student competitions on a national level, and frequently represents OSU’s turf program as exhibitors at various industry-related meetings and shows. My secondary responsibility, which is partially funded by the Giustina Turf Endowment, is extension and outreach, including the development and implementation of various applied research projects. My overall research goal is improving the environmental and economic sustainability of turfgrass management. Areas of research include the exploration of alternatives to fungicides for putting greens in the Pacific Northwest, the cost–benefit of natural grass and synthetic athletic fields, and the utilization of sustainable turfgrass varieties. The turfgrass pathogen Microdochium patch can be observed year-round in cool, humid regions. It damages nearly all grass species in Western Canada and the Pacific Northwest. Microdochium patch is a major disease on golf course putting greens from September through May. Under favorable conditions, this disease can injure or kill significant amounts of turf, which greatly disrupts the aesthetics and playability of the putting green surface. Historically, more money has been spent on fungicides to combat this disease in Western Canada and the Pacific Northwest than any other turfgrass disease. Currently, fungicides applied every three to four weeks to putting greens throughout the nine-month period of disease activity are the primary means for providing control of this pathogen, at a cost of roughly $20,000 annually per golf course. In recent years, pesticide bans and restrictions have affected turfgrass management. Unfortunately, little information exists regarding alternative integrated management strategies that might significantly reduce or eliminate the need for fungicide applications. In 2013, the Turf Program set out to explore fungicide alternative management of Microdochium patch on annual bluegrass putting greens. Preliminary findings suggested that winter applications of crop oil (Civitas One) combined with sulfur (Sulfur DF) and potassium phosphite (PK Plus) can provide disease control comparable to traditional fungicides. This treatment protocol also results in substantial financial savings. The cost to treat putting greens on a typical, two-acre golf course with crop oil and sulfur every two weeks over a nine-month period at 8.5 ounces/1,000 ft2 and 0.25 pounds/1,000 ft2, respectively, equals $5,470 ($840 for Sulfur DF and $4,630 for Civitas One) — a savings of $14,530 per season. If these cultural practices were used in place of fungicide applications in the Pacific Northwest’s 1,653 acres of putting greens, the total savings would be $12,009,045 per season. Applications of crop oil and potassium phosphite, plus iron sulfate and light rates of nitrogen, would translate to similar savings and provide a fungicide alternative rotation for elemental sulfur (Sulfur DF) applications. It is important to point out that this treatment protocol does not include the use of pesticides, which are facing increasing restrictions across the United States, Canada and the world. Projected fungicide applications on a typical golf course for control of Microdochium patch range from 11–18 applications over a 9-month period. The Turf Program has also initiated research on ways to balance or offset the potentially detrimental acidic soil conditions associated with elevated rates of sulfur and iron sulfate, which the above treatments will likely produce on annual bluegrass putting greens. The popularity of synthetic turf systems is on the rise in the U.S. However, construction and maintenance of natural grass and synthetic fields vary greatly. Synthetic fields typically have high initial construction costs ($600,000–$1,000,000), which are offset by low maintenance costs and requirements. Natural grass fields, on the other hand, are significantly less expensive to install ($200,000–$400,000), but their annual maintenance cost is often greater than. Unfortunately, little information exists regarding actual costs and playing conditions of these two types of turf systems in Oregon. That being the case, graduate assistant Brian Daviscourt began a study in the winter of 2013 comparing natural grass and synthetic fields across the state of Oregon. His objectives were to analyze and compare the costs of installation and maintenance of synthetic infill and natural grass systems. Case studies will be used to develop a survey to assess various athletic field systems on a statewide level. Projected outcomes will include an enterprise budget, user hours, cost per user and an assessment of seasonal playing conditions (ground cover, surface hardness and temperature). Preliminary findings determined that the average surface temperature of a synthetic field in August in Oregon was 52 F hotter than a natural grass fields. Therefore, on a day when atmospheric temperatures and natural grass playing surfaces are 80 F, you can expect the surface of a synthetic field to be 132 F. Natural grass and synthetic fields assessed through the summer of 2014 had similar surface hardness, a concern often associated with synthetic fields. In recent years, fine fescue has emerged as a potential sustainable turfgrass species. This variety of turfgrass tolerates low fertility and poor soil conditions, drought and heavy shade; however, cultivars have traditionally had poor wear tolerance, a critical aspect in turf selection. In the late summer of 2014, OSU became a host site of the 2014 National Turfgrass Evaluation Program (NTEP) Fine Fescue Test. The NTEP is a collaborative research and extension/outreach effort including universities across 15 U.S. states and Canada. The majority of the entries in this trial are commercially produced in the state of Oregon, making this trial important to stakeholders within the state turfgrass and seed production industry. The OSU site is categorized as “traffic tolerance — lawn/rough height”; therefore, a traffic simulator will be used to assess the wear tolerance of potential home lawn, athletic field and golf course rough cultivars that require less fertility and irrigation than the typical turf species. These plots are currently established at the Lewis-Brown Horticulture Farm in Corvallis. Sign up for the Beaver Turf Newsletter, a free e-newsletter that provides regular research, Extension and general OSU Turf Program updates. To subscribe, go to www.BeaverTurf.com.